Those protesting against the Transatlantic Trade and Investment Partnership (TTIP), the proposed new trade treaty between the European Union and the United States, are part of a growing international opposition to pacts that allow multinational companies to sue governments whose policies damage their interests. Opponents claim this right, known as investor-state dispute settlement (ISDS), poses a threat to democracy. But what is ISDS and why does it provoke such controversy? What is an investor-state dispute settlement? Investor-state dispute settlements were devised by industrialised nations in the 1960s as a way to protect their companies' overseas investments against threats such as nationalisation by the country they invested in. Supporters of ISDS say it offers a fair and impartial forum for the settlement of disputes between investors and states and, if appropriate, for deciding the amount of compensation an investor should get. They claim that ISDS encourages companies to invest in a country they might otherwise shun through fear that, in a dispute with that nation, they would be unable to get a fair hearing in its domestic courts. For an investment to be covered by ISDS, both the country where it is located and the investor's home nation must have agreed to its use. This is normally done through countries signing investment treaties with ISDS provisions. There are now about 3,200 investment treaties globally. Most of these empower investors to launch ISDS actions. So far, approximately 600 actions have been launched - though not all are reported. The number of cases has risen significantly in recent years. The Transatlantic Trade and Investment Partnership (TTIP) is primarily a deal to cut tariffs and regulatory barriers to trade between the US and EU countries. The British government claims TTIP could add £10bn to the UK economy, £80bn to the US and £100bn to the EU every year through the freeing-up of trade. The Conservatives, Labour and the Liberal Democrats broadly support the TTIP, though Labour has called for the NHS to be exempted from the ISDS measures. 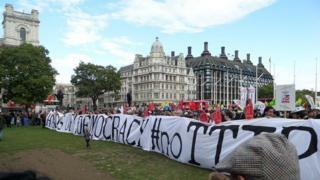 Much of the opposition to the TTIP is focused on ISDS, food standards and financial regulation. Negotiators have held eight rounds of talks on the TTIP, with a provisional deadline of December this year by EU leaders to agree a draft text. Each case is judged by a panel of three arbitrators, selected by the government and the investor involved in the case from a small pool of specialist lawyers. The tribunals can meet anywhere convenient to the parties, with decisions based on the wording of treaties rather than national laws. Cases can last for years and are costly. In addition to paying arbitrators' fees, each side has to employ a team of lawyers to argue its case. Even when governments win, as they have in around 40% of the known cases, they often have to pay their own costs - averaging around $4.5m per case. When investors win, arbitrators can award damages. There is no appeal against the level of damages, which can amount to hundreds of millions and, in some cases, billions of dollars. Why do opponents of ISDS claim it is biased in foreign investors' favour? Opponents say it is easier for foreign investors to attack a government's policy using ISDS that it would be through even the most trusted, well-established national court systems. First, they claim ISDS gives foreign investors an additional way to oppose government policies. One instance often cited occurred after Australia passed a law in 2011 requiring cigarettes to be sold only in plain packs. Philip Morris and a group of other tobacco multinationals challenged this legislation in Australia's domestic courts and were roundly defeated. In Australian law, that was the end of the matter. But Philip Morris was able to launch another action - still continuing - under an ISDS treaty. Opponents also claim that ISDS favours foreign investors over domestic ones. In Germany, after the Fukushima nuclear power plant disaster in Japan, the government announced it would phase out nuclear power altogether. Germany was sued using ISDS by the Swedish state-owned power company Vattenfall for loss of profits from two nuclear power stations that the firm co-owns with the giant German energy company E.ON. Being Swedish, Vattenfall counts as a foreign investor in Germany and so could use ISDS to claim damages. As a German enterprise, E.ON could not, despite both companies being large European power companies, facing the same potential losses on the same power stations as a result of the same government policy. E.ON is able to claim damages under property rights set out in the German constitution. But because those property rights are balanced by considerations of the general public good, any compensation from the Constitutional Court is likely to be significantly lower than an ISDS tribunal would award. Why do opponents claim ISDS is a threat to democracy? Opponents say ISDS can deter governments from enacting policies, to benefit the environment or to improve the health or safety of their populations, for example, for fear that those policies might trigger an ISDS action from a foreign investor. While wealthier countries can comfortably afford to defend such actions, cost can be a major issue for poorer nations. For five years El Salvador, one of the poorest countries in Central America, has been fighting an ISDS action launched by a Canadian gold-mining company after the nation declared a moratorium on mining licences. This followed widespread public concern of a potential threat to drinking water quality from mining operations. The gold-mining company is claiming $250m in damages - representing the profit it says it would have made had it been given a licence to mine. That $250m would represent almost 5% of El Salvador's total government budget. The gold-miner's claim may still fail - a decision is expected imminently - but opponents of ISDS argue that the fear of such awards makes many poorer countries hesitate before implementing policies that might benefit their populations. In the light of such cases, some countries, particularly in Latin America, are now considering terminating their treaties. Others, including South Africa, have already started doing so. These countries are reassured by Brazil, which - though it has never signed an ISDS treaty - can still point to large inflows of foreign investment. If ISDS has been around for decades, why is it now suddenly a big issue? For decades, while ISDS treaties were being signed, few claims were launched. Academic research suggests that most countries then regarded the treaties as little more than tokens of diplomatic goodwill, safely ignored. In the late 1990s, lawyers started waking up to the potential of ISDS and began advising investors to launch actions. The number of cases increased sharply. The current protests have been fuelled by proposals to include ISDS provision in two trade treaties: the TTIP and the Trans-Pacific Partnership. Have the protests made any difference? They seem to have done. In January, the EU Commission revealed that of the 150,000 responses to its public consultation on the proposed EU-US treaty, 97% were against it. In negotiations with the US over the Transatlantic Trade and Investment Partnership, Cecilia Malmstrom, the EU Trade Commissioner, is seeking to limit the scope of the ISDS provisions. She proposed giving governments a "right to regulate" free from ISDS attack, and exempting issues of general public benefit such as health and the environment. If she succeeds, she says she hopes the new treaty would become a new "gold standard" for ISDS, eventually replacing provisions in the thousands of existing treaties. This network, she says, is "not fit for purpose in the 21st Century". Some commentators believe the new EU demands could mean negotiations fail and that no new treaty is signed. Is it a problem for investors if the new treaties don't contain ISDS? Surprisingly, given the claims made by advocates of ISDS, it may not. Academic researchers report that when they ask investors what matters to them when deciding where to invest, investors typically cite factors such as market access, the availability of raw materials and the quality of a workforce. For all the present fuss and bother, ISDS appears to be low on their list of requirements. Michael Robinson presents Company vs Country at 2000BST on BBC Radio 4 on Monday 30 March, or later on BBC iPlayer.